Hi Everyone - it's another great Thrifty Thursday Deal over at Scrapper's Delights. Thrifty Thursday is our Bi-weekly deal when Scrapper's Delights chooses as selection of fabulous special offers for you!. Just go to the special offer page HERE, where you can pick up some great images for just $1 each! 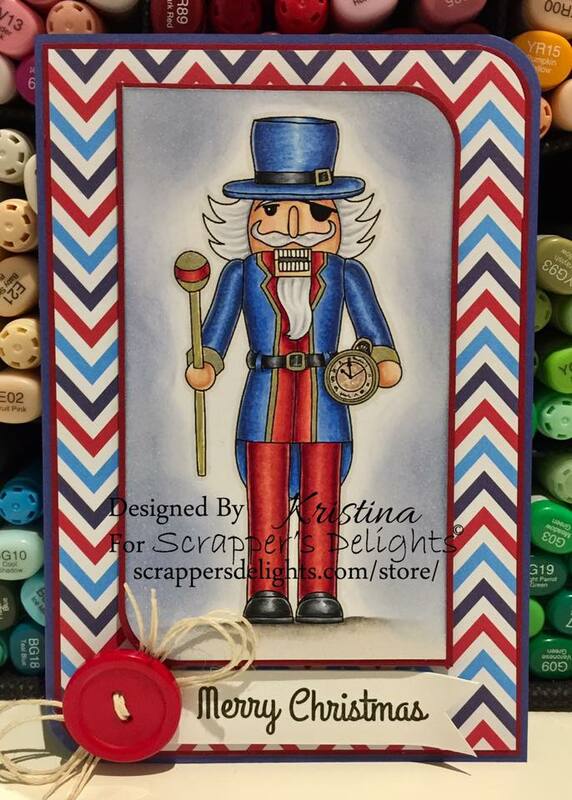 These super cute Nutcracker images are a must for your collection and great for not just Christmas cards but male cards as well. For my card this week I have used The Toymaker image. I loved using the bright and vibrant red and blue - and although not really traditional Christmas colours, the Nutcracker soldiers are very much associated with Christmas - so a Christmas card it turned into. This is such a beautiful card. Great coloring and love how the paper compliments the image and the colors you've used.